We do our best to create bouquets and arrangements that replicate the product image, but as nature is unpredictable we do sometimes have to make substitutions to the flowers or foliage. Some bouquets/arrangements ingredients can cause irritation. If you have any special requirements or allergies please contact our team info@realflowers.co.uk or call us 01730 818 300. We will try and inform you of any changes but rest assured the bouquets or hatboxes will look as beautiful and smell as heavenly as the original. Need to add a little extra something special? Shop our 'Gift Collections'. We specialise in scented garden roses. Our mission is to bring beautiful, natural, scented flowers and foliage back into a market that has lost touch with the wonder of real flowers, whilst promoting provenance and sustainability. 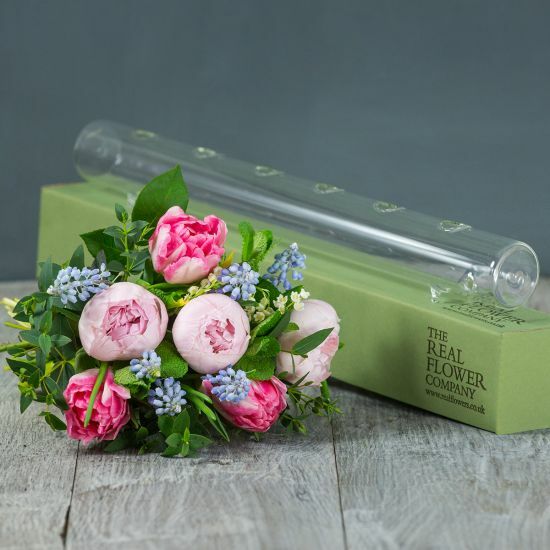 We grow a carefully curated collection of the world’s finest scented rose and flower varieties such as English scented garden roses, David Austin Roses, Kenyan Fairtrade scented roses and English sweet peas, to name but a few. We know the provenance of our flowers because we grow them ourselves on our English and Fairtrade farms. We nurture every stem from root to vase and our stringent conservation and management policy have earnt us our LEAF Mark accreditation. Few modern cut roses feature any trace of scent. This is because most commercially grown flowers have had their scent gene genetically removed to increase their durability and longevity. In contrast, we are passionate about curating and growing the world’s finest selection of scented cut roses that as well as being beautiful, boast an exquisite variety of scents. Our roses have their scent gene firmly intact just as nature intended! However, even our flowers vary in scent intensity. So, we have created the scent rating scale below to help guide you to your perfect arrangement. We offer most of our bouquets in four or five different sizes. The image below should give you an idea of how big each size is although the size varies a little for each design. For example, our ‘Simply’ range contains roses arranged head-to head so the bouquet may be slightly more compact than other designs.